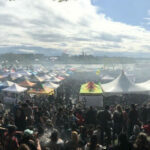 That’s according to Statistics Canada’s most recent National Cannabis Survey (NCS), zeroing in on the fourth quarter of 2018. Stats Can reports that about 4.6 million, or 15%, of Canadians aged 15 and older reported using cannabis in the last three months when surveyed in late 2018. The data reveals that a person’s use for medical or non-medical reasons had wide ranging impacts on consumption behaviours. Stats can also found that Canadians pointed to a number of factors in their decision on where they purchase cannabis. The main consideration reported by more than three-quarters of all cannabis users was quality and safety (76%), followed by lowest price (38%) and accessibility (33%). Rates of cannabis consumption reported in the fourth quarter (collected mid-November to mid-December and referencing the previous three months) were unchanged compared with the third quarter. Rates remained higher in Nova Scotia than in the rest of Canada. Consumption rates also continued to be higher among males (19%) than females (11%)—consistent with data from previous quarters. The prevalence of cannabis use over the past three months was higher among 18- to 24-year-olds (33%) than in other age groups (ranging from 5% to 21%). People reporting use in the past three months were 38 years old on average. More than half (55%) of Canadians aged 15 and older indicated that they have never used cannabis, while 3 in 10 were former users who reported no longer using it. Overall, 19% of Canadians think they will use cannabis in the next three months, compared with 15% of Canadians who reported current use. 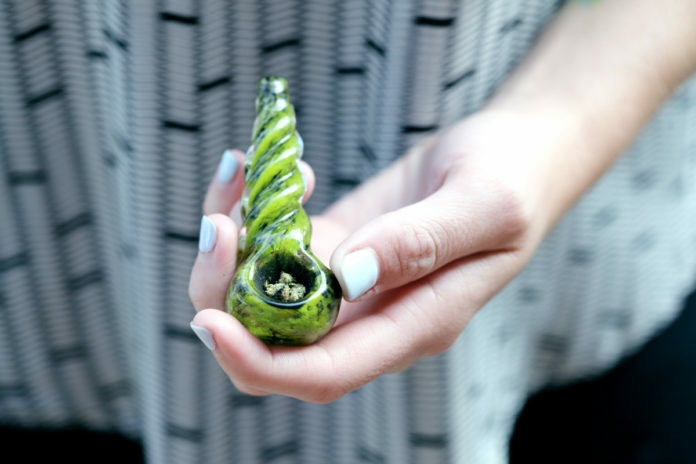 Whether a person thought they would use cannabis in the first part of 2019 largely depended on whether they currently use or have formerly used cannabis, and at what frequency. For example, the vast majority (98%) of those who have never consumed cannabis indicated that they would not use in the next three months. In contrast, most daily or almost daily (93%) and weekly (84%) users thought they would continue to use in the next few months at the same frequency. Former users and people who reported consuming cannabis on a monthly basis (or less) (ranging from 13% to 33%) were more likely to report that they would increase their consumption than people who had never used cannabis (2%). Canadians were asked their main reason for using cannabis, that is, for non-medical use, medical use with a medical document, medical use without a document, and both medical and non-medical use. 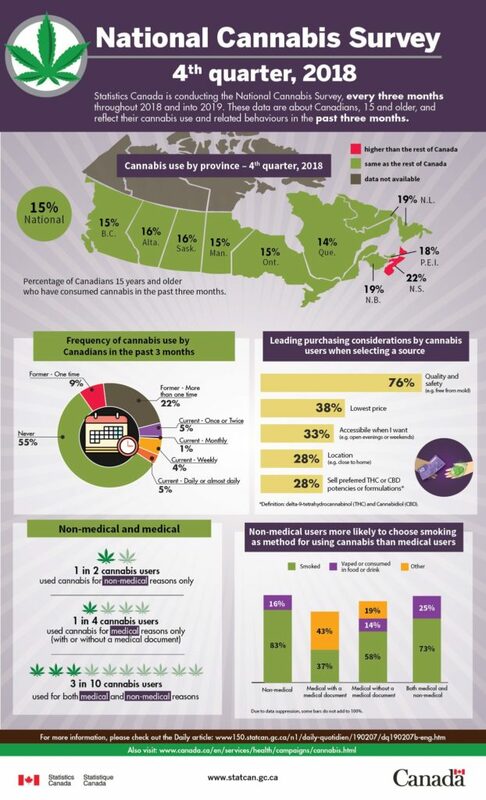 Among the 15% of Canadians reporting current use, 7% (or nearly half) reported using cannabis for non-medical reasons exclusively, 4% (about one quarter) indicated using for medical reasons only (with or without medical documentation) and another 4% (also about one quarter) reported using for both medical and non-medical reasons (mixed use). While non-medical and mixed use was twice as common among males than females (10% and 6%, versus 5% and 3%, respectively), the percentages reporting using cannabis for medical reasons, regardless of whether a medical document was obtained, tended not to differ (about 2% for each). Non-medical users were 35 years old on average—younger than medical users with medical documentation (50 years old on average), as well as mixed users who reported using for both medical and non-medical reasons (38 years old on average). Rates of non-medical use were three times higher among 15- to 24- year olds (18%) than persons aged 25 and older (6%). One in five non-medical users reported consuming cannabis daily or almost daily—a considerably smaller share than for medical users with documentation (70%), medical users without medical documentation (46%) and mixed users (46%). Regular consumption is likely related to the use of cannabis as medication or as an effort to manage and alleviate symptoms. It is also possible that regular users develop a tolerance, requiring more frequent and/or larger doses. The source from which people obtained cannabis largely depended on their reason for using. Just over one-quarter (26%) of non-medical users reported obtaining cannabis from legally authorized retailers or online licensed producers, compared with 86% of medical users with documentation, 47% of medical users without documentation and 44% of mixed users. On the other hand, non-medical users (42%) were more likely than medical users (19%) to obtain cannabis from illegal sources, including drug dealers, compassion clubs, unlicensed dispensaries or storefronts, unlicensed websites, or acquaintances. Relatively large proportions of medical users without documentation (42%) and mixed users (55%) also reported accessing cannabis from illegal sources. More than half (54%) of non-medical cannabis users also reported obtaining cannabis from friends or family—a higher share than for medical users without documentation (26%) and mixed users (33%). Medical users rarely reported using this source, making the estimate too unreliable to be published. Overall, 8% of users—almost exclusively non-medical and mixed users—reported growing cannabis either themselves or having someone else grow it for them.